We all know that murder, lying, and stealing are wrong. Many of us have also made up our minds on controversial topics like abortion or capital punishment. Yet we continue to have disagreements about such topics as we struggle to find what is the "right" answer to moral problems. Religious beliefs may provide answers for some, but not everyone is religious. And people often debate social, governmental, and business issues in non-religious terms. Can we supply a secular basis to our inherited Judeo-Christian morality? For some twenty-five centuries, philosophers have attempted to explain and account for our moral experience. They’ve tried to describe what’s worth seeking in human life, along with the moral rules that should guide our behavior and the virtues that constitute human excellence. Three major categories of philosophical ethics stretch back to ancient Greece and continue into the present. One, focusing on the consequences of actions, holds that pleasure or happiness is our basic goal; here the right thing to do is to maximize pleasure or happiness. The second category emphasizes reason, claiming that duty, rights, and justice are basic. The third category considers what it means to lead a good life, along with the role virtue plays in that life. All three trends combine to influence the current discussion of moral problems. 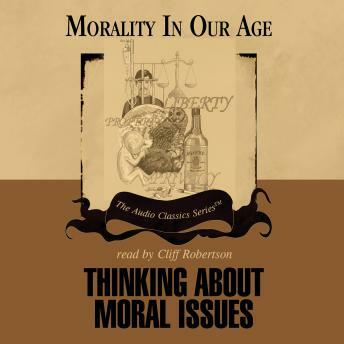 By becoming familiar with them, we can learn to think more clearly about moral issues. We can defend our decisions or opinions to others who are affected by them. And we can more effectively participate in today’s discussions about the morality of public policy issues.